Expressions of interest are being sought from nurseries interested in taking on an intern, with funding available to assist with costs during both the internship and the first year of employment if that is offered. The Hort Innovation Internship Program is co-funded by participating businesses and Horticulture Innovation Australia using horticultural research and development levies and funds from the Australian Government. The program is open to final year graduates in any course, providing nurseries with access not only to students who already have an interest in horticulture, but a whole range of other skills such as IT and accounting which are also vital in any business. The nursery industry levy is helping to fund a number of innovative research projects, as part of the Green Cities Fund set up by Horticulture Innovation Australia (Hort Innovation). 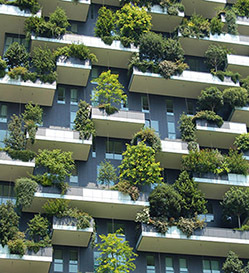 This Strategic Co-investment Fund builds on the foundation of the 202020 Vision and shares a common goal of building scientific knowledge and providing policy makers with facts and figures to back up their decisions to increase green space. Michael Worthington has been appointed as Chair of the Strategic Investment Advisory Panel (SIAP) for the nursery industry. Horticulture Innovation Australia (Hort Innovation) recently selected independent Chairs for all SIAPs, to ensure the defined objectives of the panels are met while maintaining good governance and process around discussions. Mr Worthington brings more than 25 years of vertically-integrated food and agriculture business experience to the role. 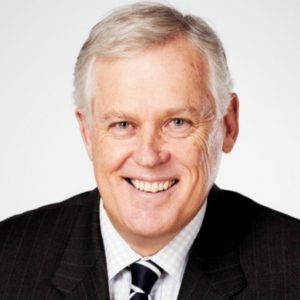 Currently Chairman of the Fresh Product Safety Centre, he has worked across an extensive range of enterprises, including production, processing, supply chain logistics and marketing for Australia, Asia, UK and US markets. 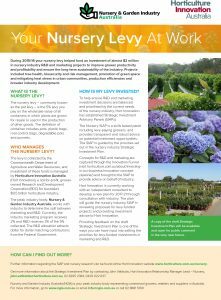 During 2015/16 your nursery levy helped fund an investment of almost $2 million in nursery industry R&D and marketing projects to improve grower productivity and profitability and ensure the long-term sustainability of the industry. But what is the nursery levy and what has it achieved for the sector over the past 20 years? The nursery industry is funding three scholarships for a newly created Masterclass in Horticultural Business program, with upcoming leaders urged to register their interest now. Many materials that were once considered ‘waste’ are now considered to be a tradeable commodity that could provide a small income instead of adding to costs – and that’s just one reason for nurseries to conduct a regular review of what’s coming into and going out of their sites. Environmental and horticultural research consultant David Hunt recently carried out an investigation of the economics of changing waste management practices, and developed a number of digital resources to help production nurseries conduct an assessment. The project ‘Assessing waste streams in Australian production nurseries’ (NY13003) was funded by Horticulture Innovation Australia using nursery industry levies and funds from the Australian Government.